Summary: Twenty-year-old Finley Montgomery is rarely alone. Visited by people whom others can’t see and haunted by prophetic dreams, she has never been able to control or understand the things that happen to her. When Finley’s abilities start to become too strong for her to handle – and even the roar of her motorcycle or another dazzling tattoo can’t drown out the voices – she turns to the only person she knows who can help her: her grandmother Eloise Montgomery, a renowned psychic living in The Hollows, New York. I loved this book. I first met an eight-year-old Finley Montgomery in The Whispering Hollows, a book that contains three short stories (“The Whispers,” “The Burning Girl,” and “The Three Sisters”) and is about Finley’s grandmother Eloise. 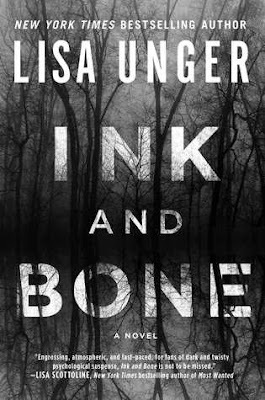 It is one that I loved and highly recommend reading; even though it’s not completely necessary to read before diving into Ink and Bone, it provides a wonderful backstory. Finley is all grown up now and she’s enrolled in college and moved in with her grandmother, hoping Eloise can help her get a handle on her abilities. I certainly won’t call them gifts. Gifts are something you generally want and something that mostly can be returned if you don’t. Finley and Eloise don’t have that option. Their friend Agatha, a powerful psychic herself, believes The Hollows to be a vortex of energy. Finley says it’s the hellmouth. I think they’re both right. When a mother exhausts all options in finding her missing little girl, she goes to The Hollows and seeks the assistance of Detective Jones Cooper and his sometimes partner Eloise. But while she chose Eloise, the visions chose Finley. Will Finley be able to locate this missing girl in time – and most importantly, will she be able to control her abilities as well as her grandmother does; or will they take a toll on her, allowing The Hollows to swallow her whole? I have ALWAYS been fascinated with psychics, empaths, telepathy, telekinesis… you name it, I want to read about it. I absolutely fell in love with Eloise in The Whispering Hollows, and I’m so happy to say that I came to feel the same way about Finley. There are moments in Finley’s life that break my heart, but I love this tough girl with her hot pink hair, her motorcycle, and all the amazing and colorful tattoos that she refuses to stop getting until her "outside looks like how she feels on the inside." The suspense of the missing little girl and the different POVs were riveting and added much to this incredible story. I love characters who take these abilities and try to help not only the living with their visions but also those unfortunate souls who are unable to move on. It’s so mesmerizing to me, and I hope with all of my heart that no deceased peeps ever come to me to help right any wrongs or assist them with any past transgressions. Nope. Nuh-uh. You don’t have to go towards the light, but you can’t stay here. With that being said, I do very much want to visit these characters again, and I know I’ll be grabbing all of Lisa Unger’s books because I’m hooked. Wonderful fleshed out characters and brilliant writing make Ink and Bone a must-read. The Hollows is a place I never, ever want to visit but that I cannot wait to read more about! Highly recommend for lovers of paranormal suspense and psychological thrillers! This Finley sounds like my kind of girl with her hair and tattoos. Deff adding this to the "wifey wants me to read this but I'm not in the mood for this genre right now" list cause I know there will come a day where I am ready and loves it. Great review! Definitely adding this to the TBR!